3.5" x 11" 7" x 11"
Insert standard sized graphic sheets into this 8.5” x 11” vertical sign stand to provide a display holder for your business’s top items or sales. 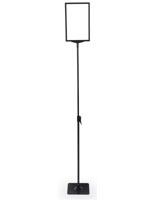 A heavy duty steel base stabilizes the height extendable pole that ranges in length from 24” - 47”. Within each plastic frame of this floor sign stand are PVC lenses to protect your custom graphics inserted using the top loading design. 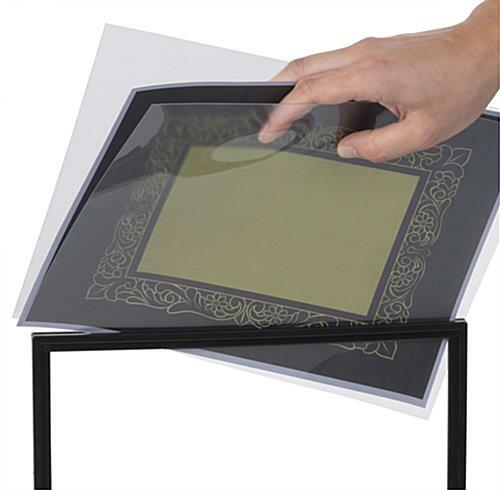 Showcase two different print sheets back to back for variety within the double sided holder. Each heavy duty steel base is compact, allowing for a small footprint and less of a footprint on your showroom floor. 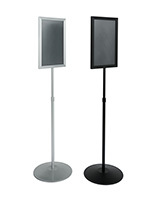 Display custom signage within the easy-to-load frame and set to the ideal height to grab attention and boost sales. 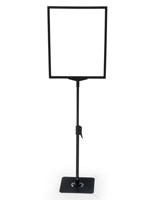 Affordable in price and effective in function, this sign stand is a suitable solution for a variety of industries from retail to food service to educational facilities! Very easy to assemble. Extremely sturdy for the price. Thank you for the great review, Cheryl! We're glad that you had an easy time putting together your floor sign holder. We hope you shop with us again soon! I work for a museum and we ordered several of these to place "do not touch" signs throughout our main building. They're good quality! The stand and platform are a good, sturdy metal. The frames themselves are plastic but they don't seem out of place on the metal. 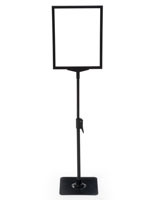 And the adjustable height is a really nice feature- you get a lot of range in height. If we find that we need more signs, we'll definitely buy these again! These look AWESOME, Jesse! Thanks so much for sharing this shot of your museum signs in action! We are so happy to hear that you love them! 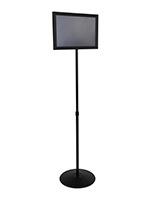 The stand is easy to put together and useful for many last minute jobs. We all know what chaos last minute jobs can create! Happy to hear that this product can come to your aid in the 11th hour! Thanks for the review, Mary! The product was super easy to put together, very lightweight, and so far seems to be doing what we need it to. The only problem we have is the sleeve with the pages constantly comes out just by 1/2 inch or so. Every time I walk by, I have to resecure the pages in the sign holder. Seems like a clip on the edge of some sort would keep them from coming out. Thank you for taking the time to review and for the helpful feedback, Beth! The signs look great! We hope you shop with us again soon. Really like the sign holder and stand. Looks great behind/beside my exhibit tables. I have a problem though, that the shipping cost more than the product itself.